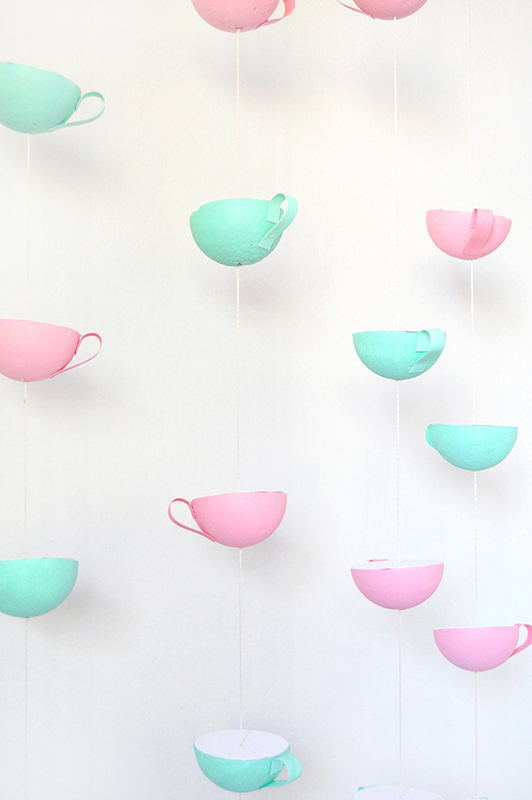 Tea parties can be so much fun to plan – I just helped organize a tea-themed bridal shower and I wish I had made this garland in time to use as decoration! 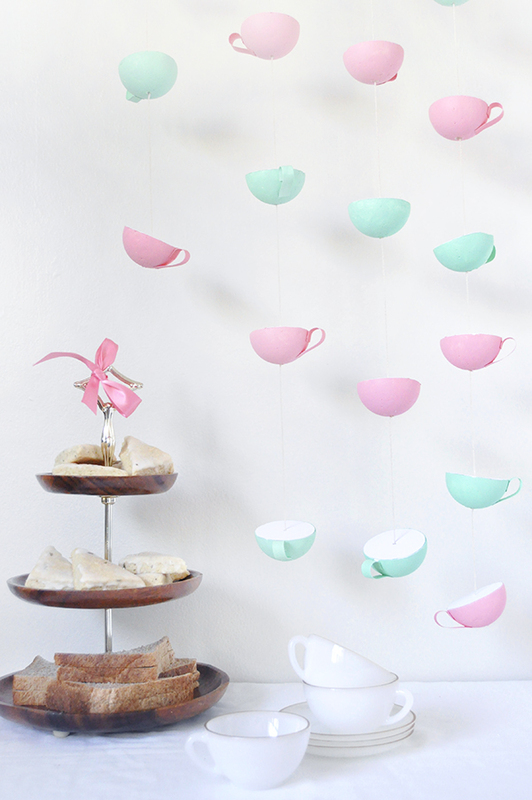 Make this garland as a super simple way to add some whimsical decor to your next tea party. Step 1: Cut the styrofoam balls in half using a sharp knife. Step 2: Paint the styrofoam halves. Let dry. Step 3: Cut circles the same size as the tops of the styrofoam halves. 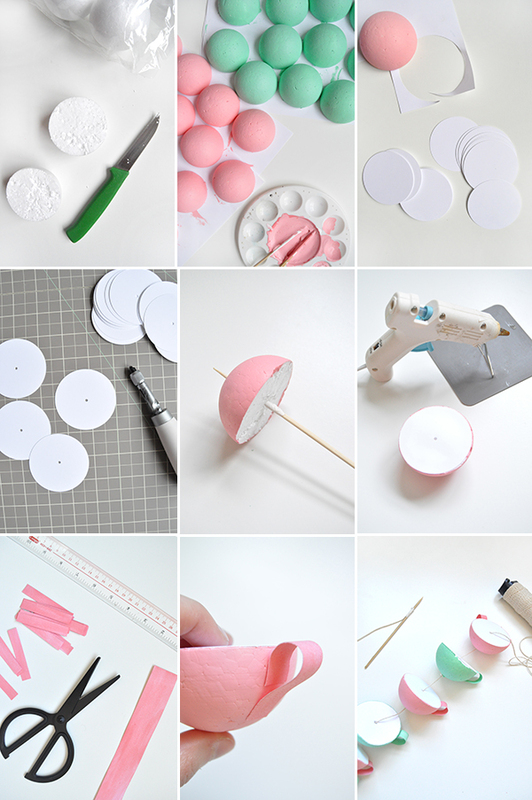 Step 4: Use a screw punch to pre-punch a center hole in the middle of the paper circles. Step 5: Pierce the stryfoam halves with the skewer. Step 6: Hot glue the paper circles on the tops of the styrofoam halves so that the holes line up. Step 7: Cut matching strips of paper about 1/2″ by 3 1/2″ long. Step 8: Hot glue onto the styrofoam halves as shown, to form handles. 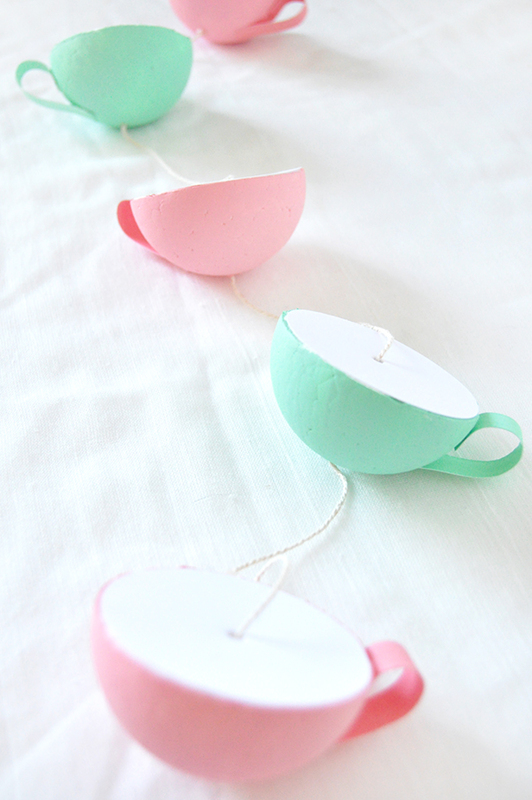 Step 9: Tape a piece of string onto the skewer and use as a needle to thread the teacups onto the string. Use a tiny dab of hot glue on the bottom of each to keep in place on the string. Love this idea, such a different idea and the colours you picked are lovely! This is so cute! 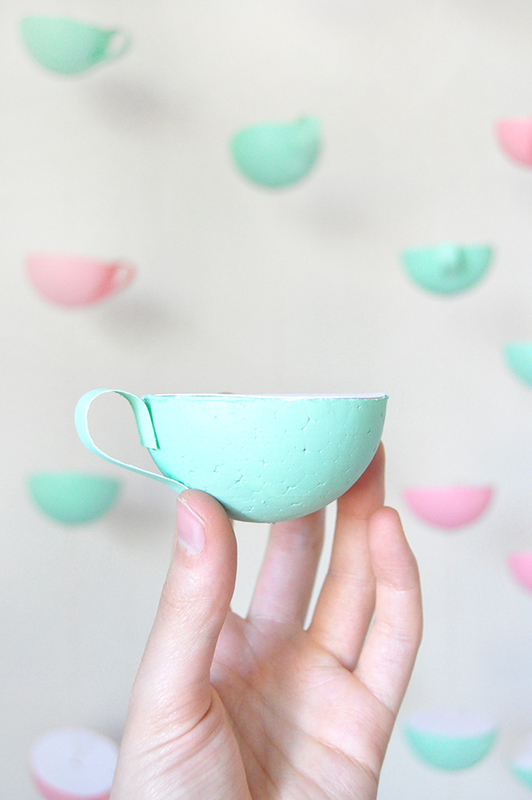 ‘I’m in love with all your party DIY ideas! I am absolutely in love with this and will be looking for an excuse to use it immediately!!! Super cute! Love these and will put to good use for certain. Keep coming up with these great ideas, you bunch of geniuses. This is brilliant! doing it for my next party! Love this idea. I was thinking of having a teaparty with my daughter and her friends. What a fun use of Styrofoam. Too cute. Whimsical and creative idea. I’d like to try using even smaller balls to make the garland. Thank you for sharing! I cannot tell you enough how PRECIOUS this is!!! Keep up these amazing ideas WoohoooO!